Recycling the same futuristic design that we saw introduced with last year’s model, the Lenovo Yoga Book C930 looks just as intriguing. For a hybrid, it’s incredibly lightweight and slim, making it the perfect companion when you want to mix pleasure and productivity while being on the road. And because it’s part of the Yoga family and features that eye-catching hinge, it can be used in three different modes – laptop, tablet, or tent.What’s new here is that the Lenovo Yoga Book C930 features a dynamic e-ink screen, which acts as the keyboard and trackpad when it’s used in the traditional laptop mode. 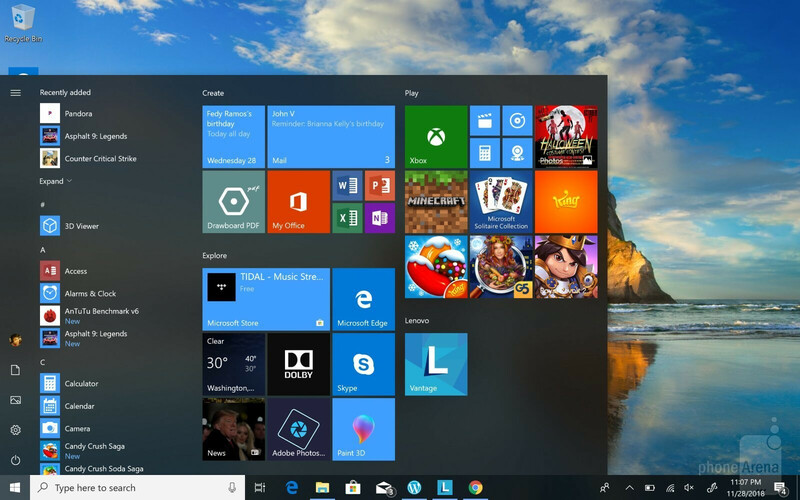 Indeed, this touch-based experience isn’t for everyone, and we find ourselves operating at a slower pace compared to when using a physical keyboard. However, we feel as though our rate of typing could be increased if there was an auto-correct option, but it’s only available when using the usual Windows on-screen keyboard. And finally, since it’s an e-ink screen with no backlighting, typing in the dark is nearly impossible. In any event, we still value the device's compact size and light-weight feel! Those two qualities alone make it an attractive offering for anyone looking to travel light. Additionally, it houses TWO USB 3.1 Type-C ports, 2 speakers with Dolby Atmos support, a fingerprint sensor for unlocking, and a microSD card slot. Due to its incredible thinness, however, there’s no headphone jack, which is a bummer in a way. 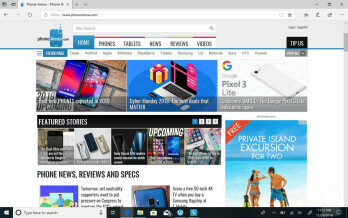 As for the C930’s main display, it’s a 10.8-inch QHD 2560 x 1600 IPS display that looks substantially sharper than what was put in with last year’s model. There’s very little distortion when looking at it from slight angles, which is great, and it’s complemented by its ability to produce rich and vibrant color tones. 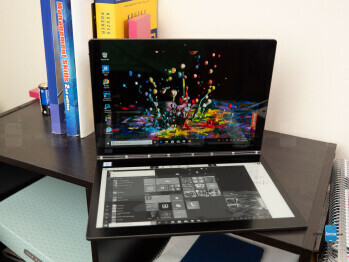 It may not be the brightest screen around in its size range, but we find that it’s still more than usable for reading. Speaking of that secondary e-ink display, it’s even more suitable for reading because it doesn’t strain our eyes when staring at it for longer periods of time, which is a characteristic of e-ink displays in general. 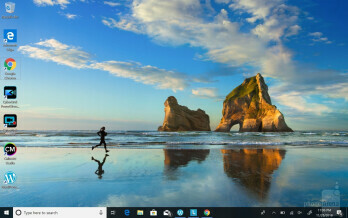 However, it’s fairly limited in what it can do because for now, it’s mainly reserved for note-taking, drawing, and viewing of PDF files. Unfortunately, it doesn’t support any e-book file formats – so to that degree, it doesn’t replace a true e-reader.Nevertheless, the e-ink display here is useful in the way that it replicates the paper-meets-pen experience, so if you’re apt to that more than typing, the option is here with the included Lenovo Active Pen, which has 4,096 levels of pressure sensitivity. 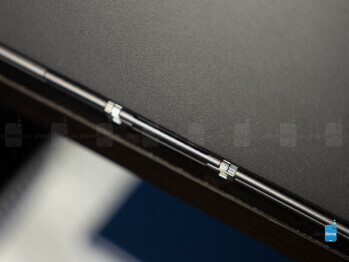 And even though there’s technically no placeholder for the Pen within the Yoga Book C930, it features a magnetic connection that keeps it firmly tethered to the casing when it’s not being used. 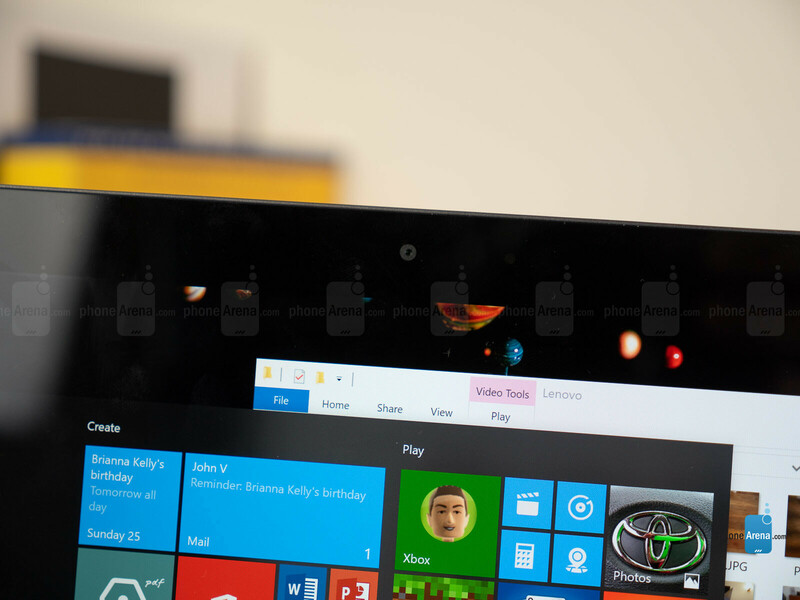 The Lenovo Yoga Book C930 is only being made available as a Windows 10 offering. 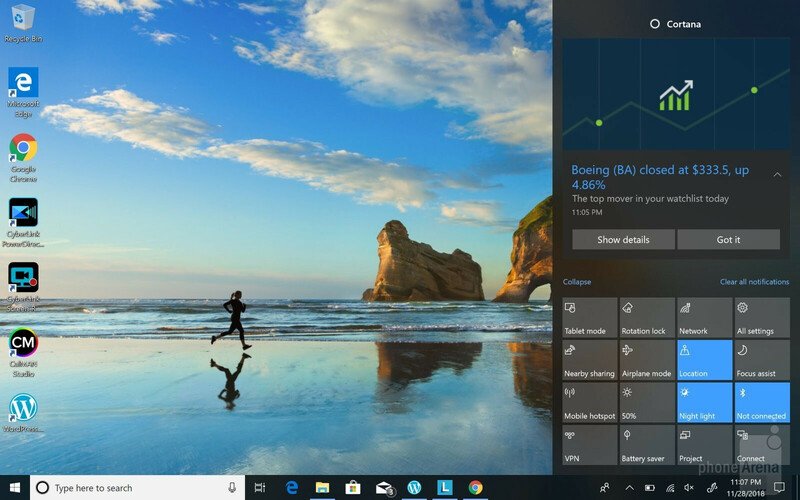 We wouldn't miss having an Android-based option since Windows 10 has significantly more potential for productivity. 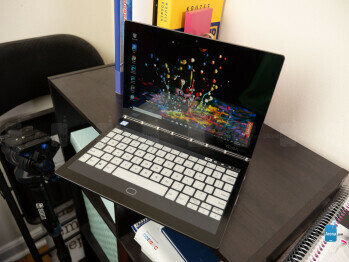 What’s nice is that the C930 bridges the tablet and laptop experience, seeing that we can quickly go from using it in traditional laptop mode to full tablet mode by swiveling the display. Even better is the fact that it can do just about anything! 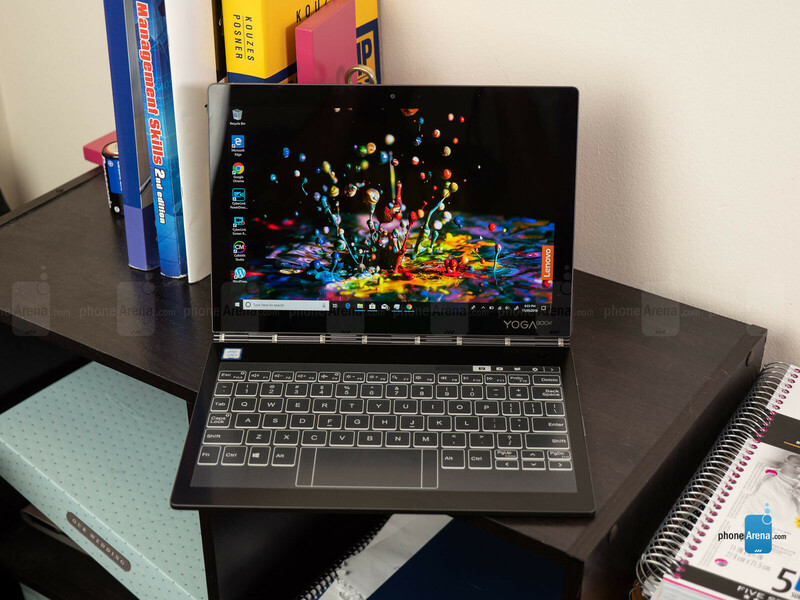 From surfing the web to editing video and even some gaming, the Lenovo Yoga C930 offers the same level of versatility that other Windows based hybrids offer. 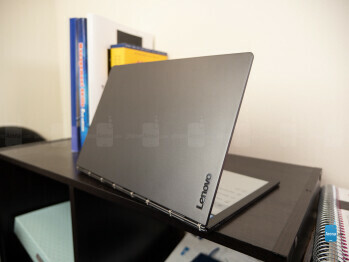 While Lenovo's convertible can indeed perform the same functions and tasks as other laptops, it isn't necessarily as effective at those. 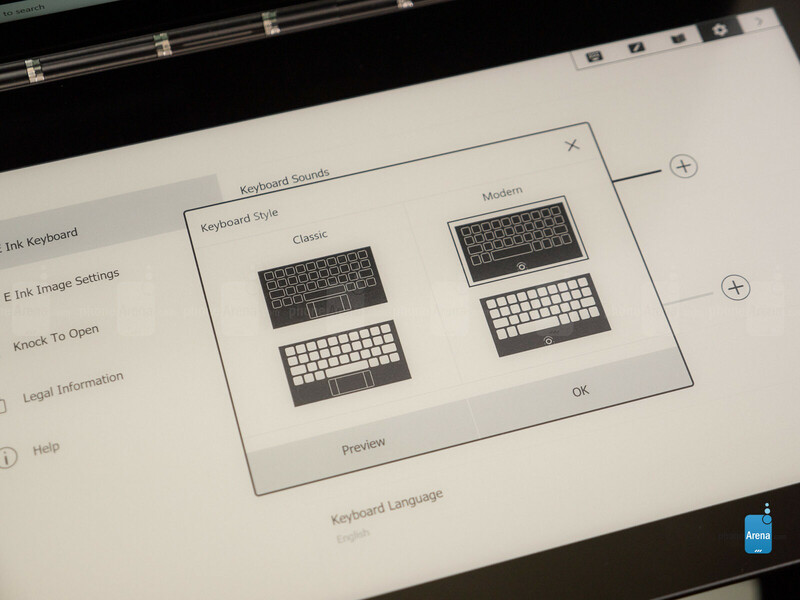 Because of its unique dual-display configuration, there are some challenges to using its e-ink display for typing. It gets the job done, offering a subtle vibration feedback when keys are pressed, but it can’t match the convenience we get from traditional laptops and hybrids with physical keyboards. There’s still room for improvement to enhance the typing experience, such as adding auto-correct based on contextual clues in what we’re typing. Adding to its productivity value, you can actually switch the e-ink screen from its keyboard mode to either the pdf reader or sketch pad at any time by pressing the corresponding icons in the top right area. It's useful in the way that you can be reading something with the main display while also jotting down notes using the e-ink display. And speaking of that, if you flip it into tablet mode with the e-ink facing upwards, the main screen will power down and you can save more power by using the e-ink screen by itself. 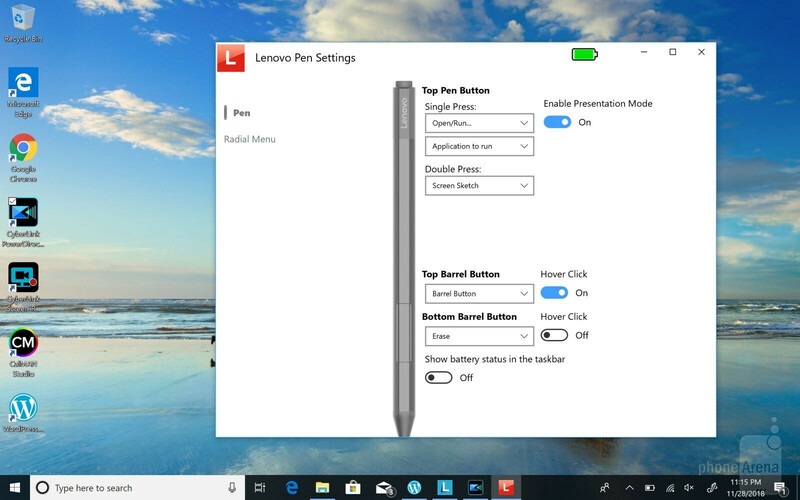 Furthermore, you can leverage the Windows Ink Workspace app with the Lenovo Active Pen to draw sketches, add stick notes to the desktop, and more. The e-ink screen doesn’t support additional apps or software, and there’s no indication that it will offer any support down the road either. If you’re willing to invest more patience into adapting to its unique keyboard, you may be surprised by its utility. You can say goodbye to Intel Atom and hello to a 7th generation Intel Core i5 Y-series CPU! This is a tremendous upgrade that undeniably offers more power for getting things done on the road. 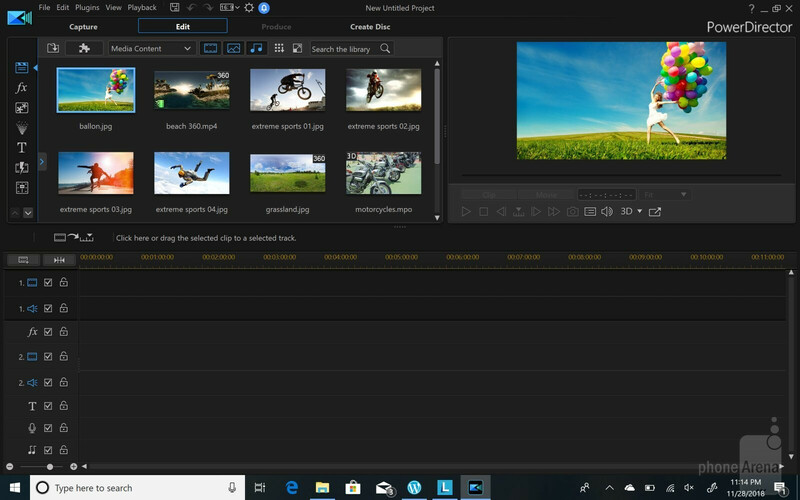 In the past, Atom-based hybrids we’ve tried out struggled to handle 4K video editing, but we can say that it’s not a problem here with the Yoga Book C930, which is accompanied by 4GB of RAM. 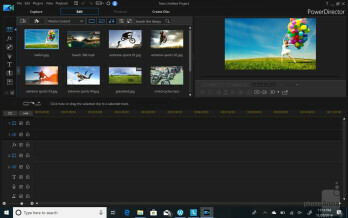 In fact, there wasn’t much stutter or lag when editing 4K clips on the fly using Cyberlink’s PowerDirector 17.Even with a super skinny frame, inside the device there's room for a generous 256GB SSD that offers enough storage out of the gate. There’s expansion courtesy of a microSD card slot, but it’s annoying that it isn’t easily accessible because it requires a SIM ejector tool to access. 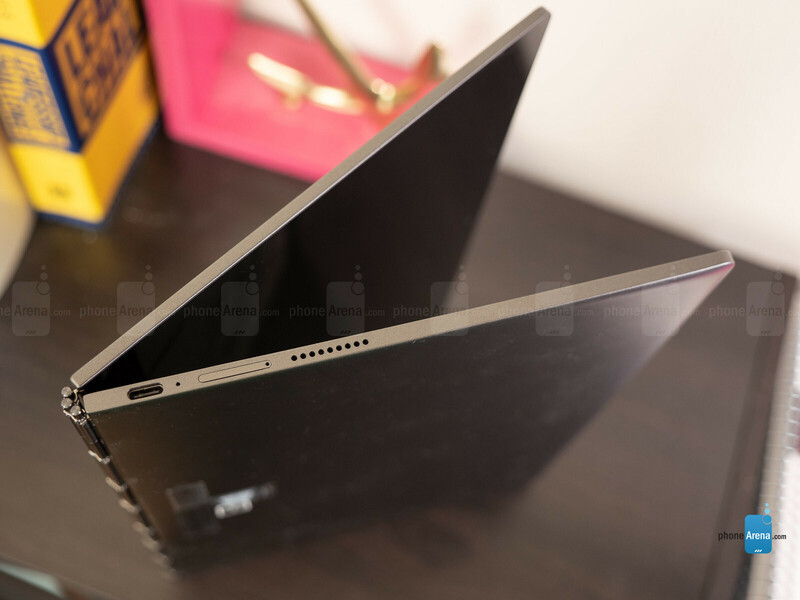 Lenovo chose to slap the Yoga Book C930 with only a single 2MP camera that’s placed above the main display – reserving it mostly for video chatting and whatnot. Gone completely is the “main” camera from last year’s model, which means that you won’t be able to properly snap photos. We’re not particularly bummed by the omission, but we can understand how others may feel compelled to using a tablet to snap photos when there’s nothing else around. Not surprisingly, there’s nothing too great with the performance out of the 2MP camera. We wouldn’t even bother using it for selfies either, since its shots are muddy-looking in general. 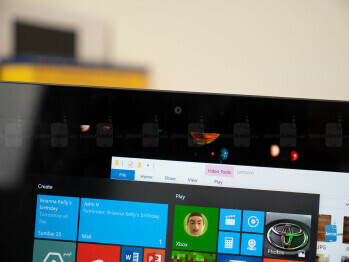 For Skyping or video chatting, it certainly is good enough to use, but that’s about the extent of its usefulness. Given how the fingerprint sensor has replaced the “rear” camera that came with last year’s offering, it’s a compromise we’re willing to agree with. You wouldn't expect something so thin and light to deliver outstanding results when it comes to battery life, but that’s the reality with the Lenovo Yoga Book C930. In our day-to-day experience, its battery delivers enough longevity to provide an entire day’s worth of basic productivity, which consists mostly of email replies, surfing the web, listening to music, and light word processing. When it comes to heavier things like video editing, we easily get 6 hours of heavy usage from a full charge. If you’re the kind to periodically use a laptop, this is something that’ll easily get you through a weekend. With this year’s model, Lenovo enhances the Yoga Book to make it even more functional. 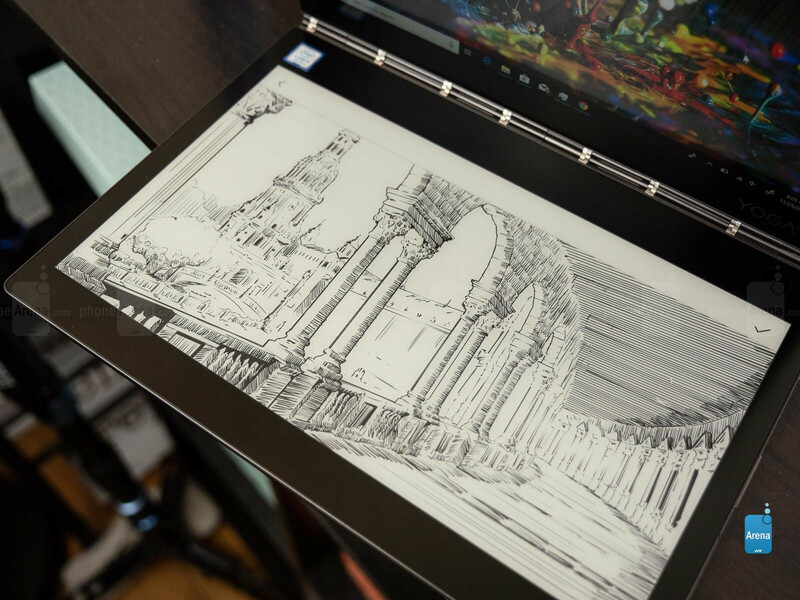 Switching to an e-ink display that transforms from a dynamic keyboard to a canvas for all of our note-taking and drawing needs, this Windows 10-powered hybrid offers significantly more functionality than its Android predecessor. 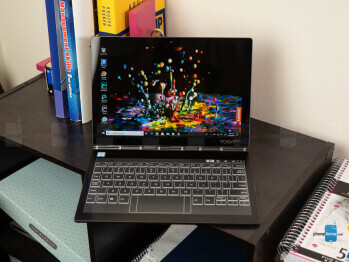 But then again, its superiority is reflected by its higher price of $1049.99.In the space right now, the Lenovo Yoga Book C930 is unlike anything else, which – combined with its pricey cost – can make it a tough sell over other comparable models. Take for instance the Microsoft Surface Pro 6 that starts at $899 sans keyboard (+$129.99 for the keyboard). The Surface Pro 6 offers the better 8th-generation Intel Core i5 processor. 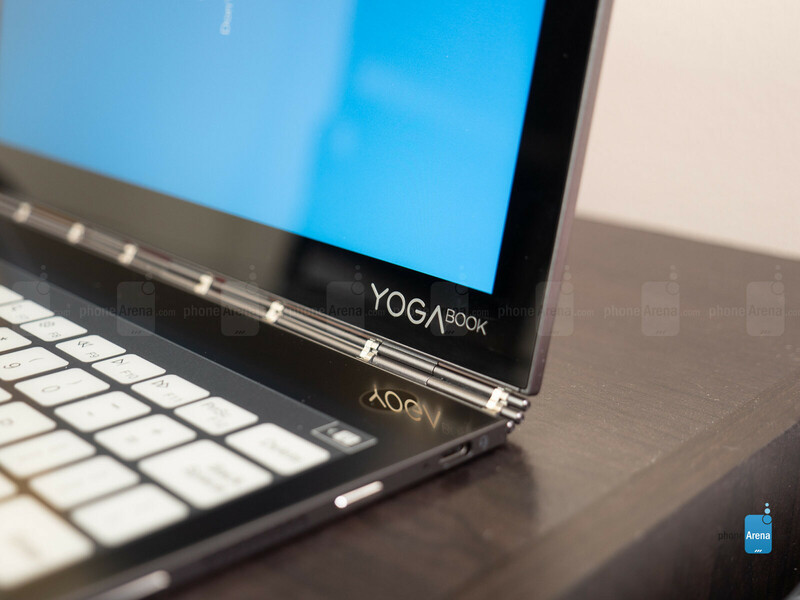 However, the Yoga Book C930 is an option worth considering because it bridges the tablet and mobile laptop experiences together – just as long as you have some patience in learning and acquiring a taste for its keyboard.